Ever since Pokemon Black and Pokemon White, I’ve been considering retiring from the franchise. Each core game has essentially been the same thing, and I’ve been playing since Pokemon Red and Blueon the Gameboy way back when in 1998. Pokemon X & Y were fun, but better visuals weren’t enough to keep me playing after the credits rolled. Now, out come Pokemon Omega Ruby & Alpha Sapphire (more lovingly referred to as Pokemon ORAS), and not only has it rekindled my interest in the franchise, but for the first time ever I actually want to catch them all. 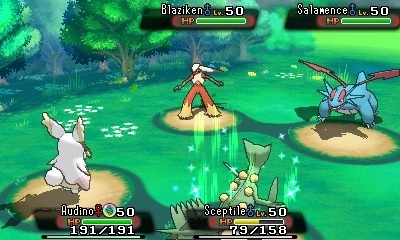 Pokemon ORAS is a remake of the Game Boy Advance games originally released in 2002. The visuals have been updated to match those in X & Y, and it looks great. While not much different visually, there are some added details that help ORAS stand out over its predecessors. Some Pokemon have special sprites when surfing, which is a nice detail, and flocks of bird Pokemon often fly overhead or take off from the ground when you get too close, which makes the world feel more alive. Visuals, of course, are only the icing on the cake. What really makes ORAS stand out over previous titles is the sheer number of new features and overhauled content. ORAS focuses heavily on exploration and adventure, two things the series has been lacking lately. When walking the routes between towns, Pokemon can actually be seen in the field now. Their shadows will sometimes pop up, and you can sneak up on them by gently nudging the control pad. Paired with this feature is a device called the PokeNav Plus. It allows you scan for any Pokemon you’ve encountered in the wild. The more you track one kind, the better your odds of finding ones with special moves or other bonuses. I found a Shiny Poochyena this way! Searching for Pokemon with the PokeNav Plus is really fun and breathes new life into an otherwise aging concept. Running around in the grass hoping to randomly stumble on the Pokemon you’re looking for feels antiquated now. Sneaking up on hidden Pokemon makes you more engaged as a player, and feels closer to what this process might be like in real life. There is a legitimate rush when a shadow pops out and you hear the call of the one you’re looking for. It’s a great feature, and it should become a permanent mechanic in future iterations of the series. 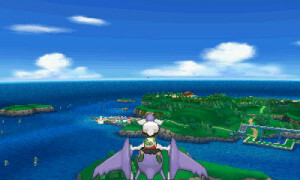 The best new feature by far in ORAS is the ability to soar. Once you get either Latias or Latios in your party, you’re given a special flute that can call them to pick you up and fly you around the map screen. You have complete control while in the skies, and you can land anywhere you’ve already been, and even find secret areas that were previously unreachable. It’s reminiscent of the Flammie Drum in Secret of Mana , or the airships in the Final Fantasy series of games. It’s a callback to a time lost past where games, RPGs in particular, gave you the freedom to explore in fun and interesting ways. Not every new feature in ORAS is awesome, unfortunately. The big gimmick ORAS boasts is the Secret Base. Basically, you can find hidey-holes all over the map and turn one into your base. You can customize it with a bunch of stuff from furniture to Poke dolls. I ignored this feature, honestly, because it feels pointless. I can see where it might be fun finding other player’s bases, but I’d rather spend that time catching Pokemon and exploring the map. One thing that’s disappointing is that there is no character customization this time around. X & Y let you change everything about your character from their skin color to their socks. Now your only choice is your gender. It’s a feature the fans have wanted for years, and it was taken away as quickly as it was introduced. There have been several great features like this that have come and gone in the last few years, such as having a Pokemon follow behind you in Heart Gold/Soul Silver, or being able to visit other regions from previous games (also introduced in Gold/Silver). Some DLC where you could travel around getting gym badges in Kanto or Johto would be a dream come true, but it’s probably asking a lot from a company like Nintendo who have only until recently began to embrace downloadable content. Pokemon hasn’t focused as much on exploration in the last few titles, it seems. Black/White had an emphasis on story, while X/Y tried too hard to wow you with their amazing visuals. Pokemon is at its best when you can get lost in a cave or on the high seas, and ORAS has remedied this. It’s packed with features and content that makes catching them all not only possible for mere mortals, but makes the game fun and exciting again. Pokemon Omega Ruby & Alpha Sapphire were developed by Game Freak and published by Nintendo. They are currently available on the Nintendo 3DS and 2DS, either by physical copy or though the Nintendo eShop for $39.99 each. A copy of Pokémon Omega Ruby was independently purchased by the reviewer.